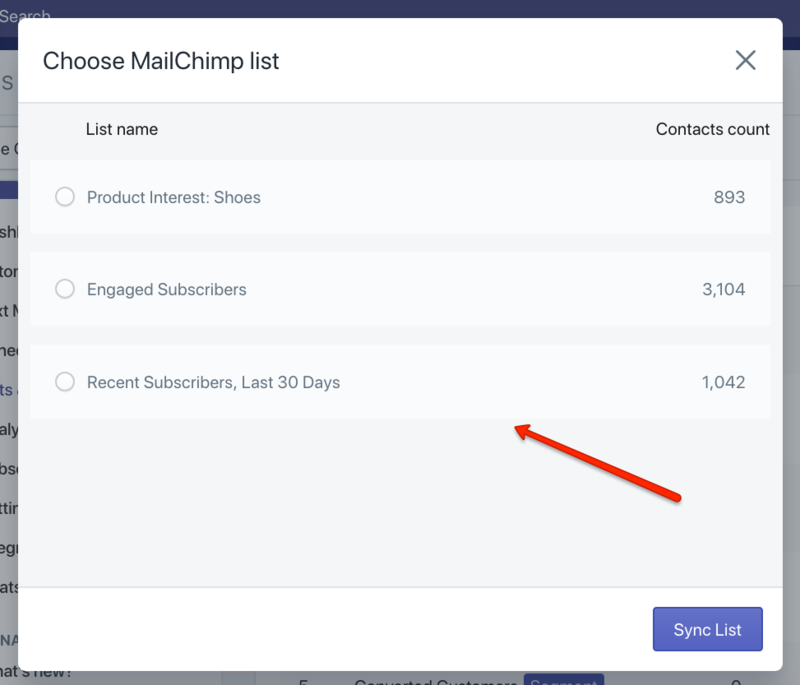 MailChimp is one of the most popular email marketing platforms that makes it easy to build and grow contact lists for launching your marketing campaigns. Now you can use SMSBump and MailChimp together to add SMS notifications to your email marketing strategy. 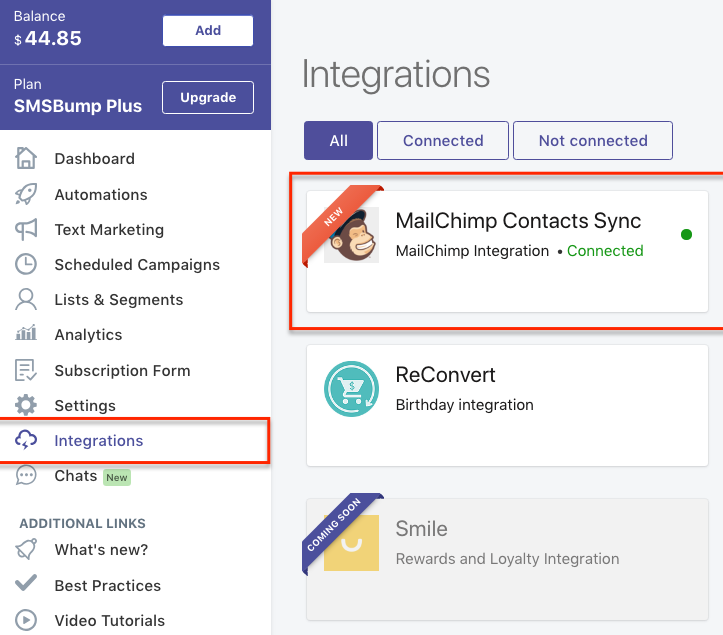 You can sync your MailChimp contact lists with SMSBump and start messaging them with your updates, promotions and marketing campaigns. 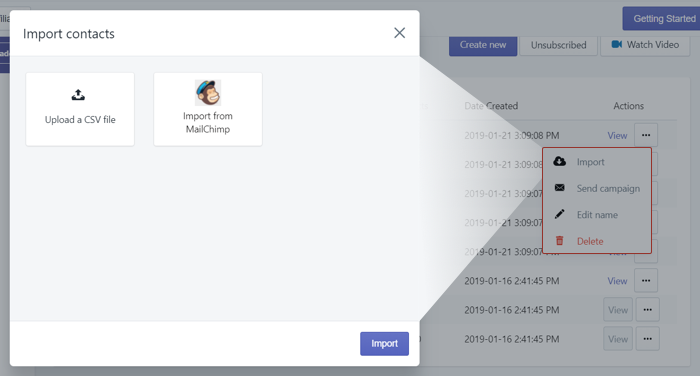 In this article, you’ll learn how to connect MailChimp and SMSBump for Shopify. When you’re done, this will enable you to sync your contact lists and start sending them SMS marketing campaigns, notifications, personalized deals and exclusive offers. 1. Have an active MailChimp account with contact lists. 2. Have SMSBump installed in your Shopify store. Got this covered? You’re ready to begin the integration setup. 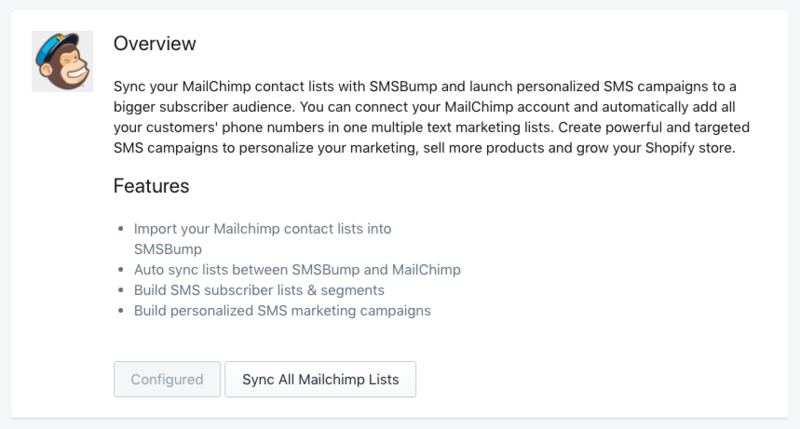 SMSBump will sync with your MailChimp contact lists so you can see them in your Lists & Segments section. From there on, you can use them to build different lists and launch SMS marketing campaigns to the contacts inside. 1. Go to the SMSBump Dashboard and click Integrations. 2. Select the MailChimp integration and click Configure. 3. A popup will appear. Enter your MailChimp username and password. 4. Done! Now you just need to Sync All MailChimp Lists. 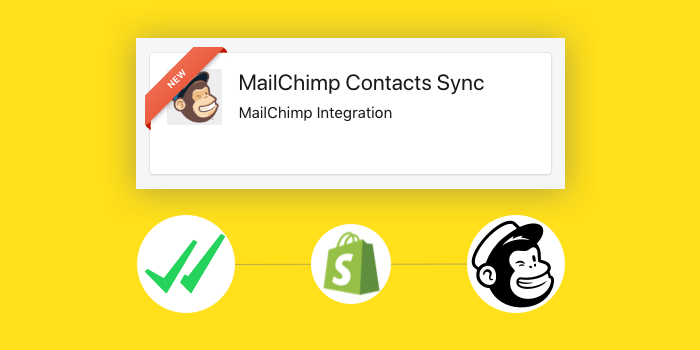 Once you click the Sync button and the process is complete, you can go to Lists & Segments to see your MailChimp contacts transferred to the SMSBump Lists. Important: Keep in mind that the sync will only transfer the contacts in your MailChimp lists that have a phone number. This is why you might see a smaller amount of contacts in your SMSBump Lists after the sync. They are the ones that have a number you can use to send SMS campaigns to. Congratulations! 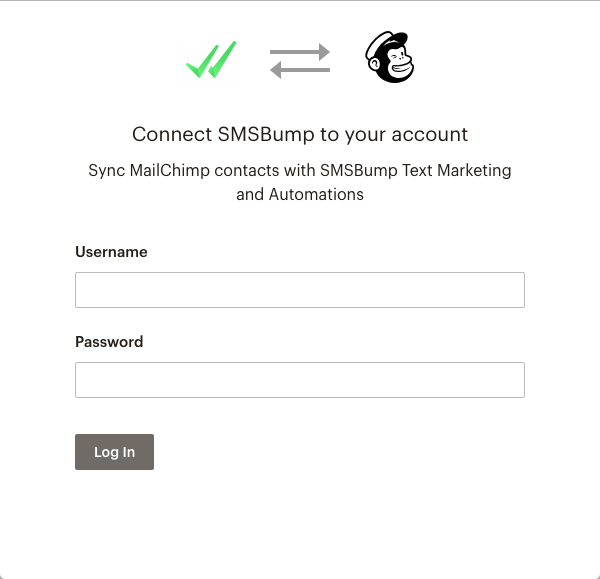 SMSBump and MailChimp are now connected! When Are the Sales Coming? Now you have the contacts and you can do everything that SMSBump allows you to do. Import each MailChimp contact list you have and start building your SMS marketing campaigns. 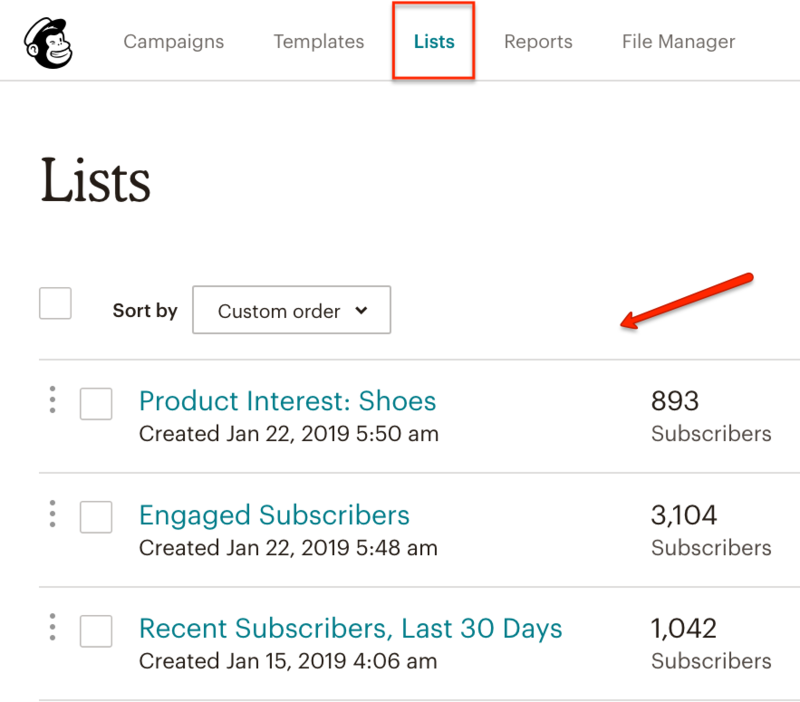 You can use all the contacts you have in your MailChimp account and segment your subscribers into different lists. SMSBump will automatically get those lists whenever you create new ones in MailChimp or delete old ones. Every time you make a change in your MailChimp account and go back to SMSBump to import a list, they will stay updated with your latest updates. Email vs SMS: Why Not Both? Sometimes subscribers might miss your marketing emails when you send them out. It’s okay, in this day and age your inbox is always full, you can’t check and act on every email you get. That’s why using another channel to distribute your marketing messages is always a good idea for those subscribers who won’t get your emails but won’t miss a text message on their phones. You can launch the same deal and call-to-action you’re using for your email marketing campaign, but using SMS. 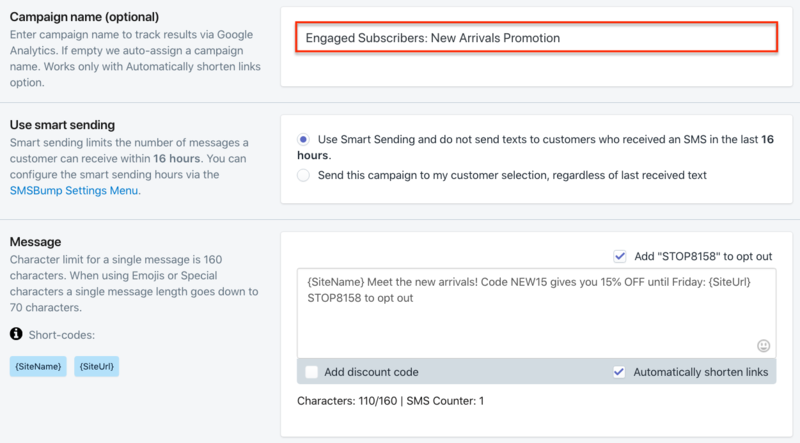 For example, this New Arrivals Promotion for your Engaged Subscribers list. Let’s say you’re preparing the newsletter, but you want to make sure that it’s seen by as much contacts as possible. So you launch an SMS campaign together with it. You have your brand name, the deal, the call to action and the limited-time offer leading to your website. You can use the same main points from your email campaign and replicate them in the form of a text message. That’s it! 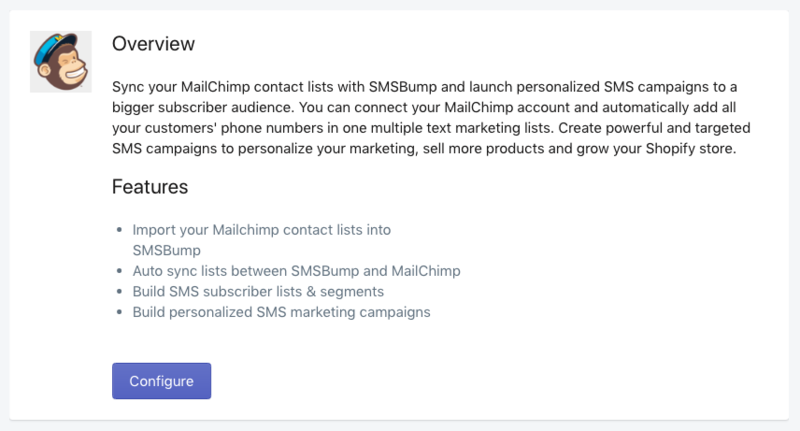 You’re now ready to sync all your contact lists, build different segments from MailChimp and import all of them in SMSBump to add a new way of reaching your subscribers with marketing messages that are instant to notice, fast to read and easy to act upon. If you want to find out more about customer segmentation, start here.